This issue featuring a look at the proposed Chet Morton series, a behind-the-scenes look at Hardy & Hardy Investigations, a directory to articles in this and all the previous issues as well as new collectible discoveries, letters and more! 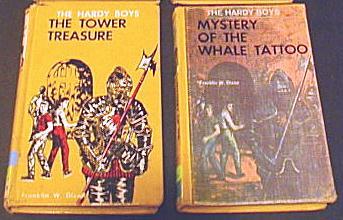 As many of you may already know, May 2002 marks the 75th anniversary of the Hardy Boys. While the publisher of the series doesn't seem to care, here at the Bayport Times it's cause for celebration. So far there have been 58 stories & 38 revisions in the original series, 114 Digests, 127 Casefiles, 17 Clue Brothers, 2 Ultra Thrillers with Tom Swift, 36 Super Mysteries with Nancy Drew plus over a dozen speciality books like the Detective Handbook, activity and puzzle books, etc. - more than 400 different books!!! So take your favorite Hardy Boys book down from the shelf and re-read it in honor of the world's greatest teenage sleuths, Frank and Joe Hardy! Printed in the far East. Shown next to US edtion for comparison. Ghost Stories New Cover Art! Last May I had a chance to travel to New York City to visit the Stratemeyer Archives in the New York Public Library. 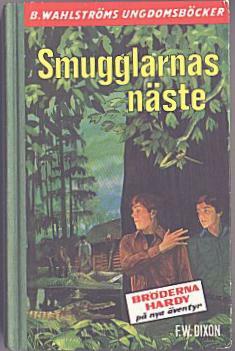 I was there once before, and spent the whole day going through the archives of Hardy Boys related material. The first time I went, I found a lot of info, but this time, I ran across something very interesting! I found a file that contained a series proposal for one of the characters in the Hardy Boys books. Chet Morton! Apparently, back in 1965, the Stratemeyer Syndicate was in a spin-off mood, and wanted to develop a brand new series based on Chet Morton and his hobbies. In each story, Chet would be involved in a new hobby and thus get involved in a mystery that was somehow related to his current interest. 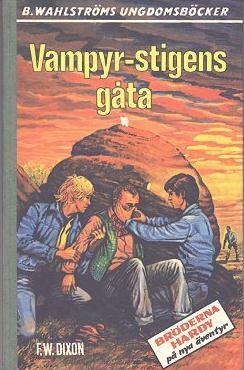 Chet's hobbies were already being related in the Hardy Boys stories, but the Syndicate felt at that time that Chet had become popular enough to have a series of his own. As you can tell from the titles, there was to be a lot of humor in the stories. I read the series proposal, and it described Chet as being a "Master of Disguises" as well as having a mania for hobbies. When I read some of the sample chapters, I discovered that the Hardy Boys themselves would be featured in the series too, but this time as supporting characters. In this series, Chet was going to run the show. I don't know why the Stratemeyer Syndicate never developed the series, especially after so much planning had already been done on the new series. It's anybody's guess as to how popular the series would have been, had it been developed. I would have enjoyed reading the books. 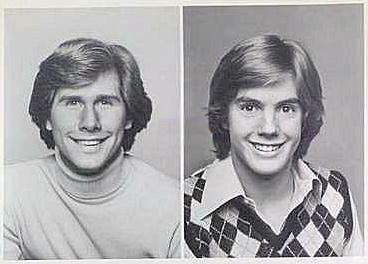 I thoroughly enjoyed digging through all those archives, and getting a real behind the scenes look at The Hardy Boys and their chums, and unlocking a lot of "Hidden Gold". There is so much to go through, you could literally spend days reading all the material. It all started at one of those wonderful California pool-side parties, when a half dozen of us were deciding what to do about the Hardy Boys artwork that Tony had just purchased. It was the original paintings for the paperbacks, and we were having trouble identifying which books they were for! The year was 1995, but I am getting ahead of myself. The true roots of “Hardy & Hardy Investigations” go back 10 years before this to August 1985 for “Dave Farah’s Guide” (to Nancy Drew). Dave came up with a workable format for identifying unique printings of Nancy Drew books. Using a combination of the year of printing, with a letter following it to indicate how many printings there were that year, then a hyphen and the over all printing number. Example: “The Secret Of The Old Clock” 1948B-53 means this is a 1948 printing, the second printing that year, and the 53rd over all printing since the book first came out. This formula allows for easy updates to the book. This book is spiral bound so that it is easy to keep open for reference. Then in June 1992 came “The Bayport Companion” by Charles Heffelfinger. 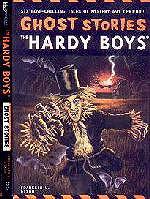 Also influenced by Dave Farah, Charles used a simplified version to create the first guide to the Hardy Boys. Unfortunately this book had two problems: 1) It was too simplified, there were seven books where he could not tell the first printing from the second, including the first three titles. 2) Charles stopped at the last Dust Jacketed book and didn’t cover anything after #40. The Companion is a handsome perfect-bound paperback. 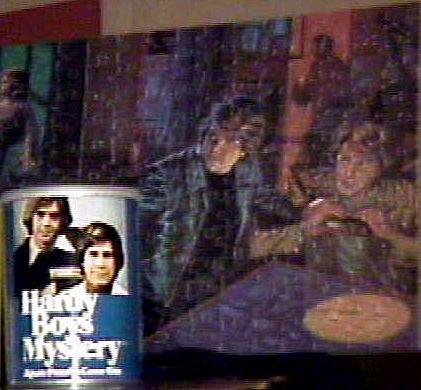 This immediately put Tony Carpentieri into action, he announced in The Yellowback Library that he would be putting together a Picture Cover guide for the Hardy Boys to be called “Frank and Joe Turn Blue”. This was published in December of 1993. I was not yet co-author, but I did assist in this publication. It used some of Dave Farah’s coding, but Tony avoided assigning a date to any of the printings and just used the number of titles on the back as the printing code. A letter “A” or “B” preceded this number and indicated which back cover was used. But like Dave, a letter after the number would indicate more that one version has the same back title list. Then there was a Colon and another number, this indicated how many times that back was used. Confusing? This system would be dropped in three years with the next publication. “Frank & Joe Turn Blue” is a Spiral Bound book. Now we have arrived at the pool-side party. Tony and I had been talking about the problems we were having with the incompleteness of “The Bayport Companion” and we wanted to bring it up to the caliber of Dave Farah’s Guide. An offer was made to Charles Heffelfinger to buy the rights to his book, but he turned us down. We realized this was probably for the better. We could start from scratch and keep records of the locations of all the books we referenced so that we could re-visit them as new information is needed. At this point Tony felt he could not handle this alone and I agreed to come on board as a co-author. The proposed book was discussed as a group around the pool and Victoria Broadhurst came up with the title “Hardy & Hardy Investigations”. 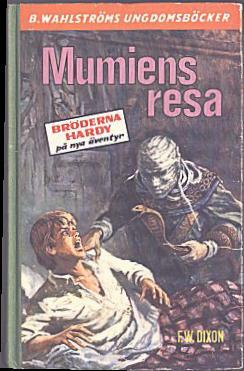 I should explain that, for legal reasons, we can’t use the name “Hardy Boys” in the actual publication name. To keep things uniform, it was decided to drop the codes used in “Frank and Joe Turn Blue” and use Dave Farah’s coding system. He gave us permission to do so. The first edition of our book put the old “F&J Turn Blue” codes for the picture covers in parentheses to help with the transition, but these were dropped in the second edition. We would continue the spiral bound format. Charles Heffelfinger’s main source was Kerri Kowalski’s collection, and we realized that we would need the same access to this collection for out reference. Once this was granted, we were on our way. Over three dozen collections would be visited to put out the first edition. Due to the above mentioned problem of identifying artwork for the paperbacks, we decided that we would expand the guide to cover all of the paperbacks. I had the largest paperback collection, so that part was solely put upon me. Bob Nelson, also at the pool-side party, contributed greatly to this project. He knew when he bought every book! The first edition of “Hardy & Hardy Investigations” came out in December 1996 with over 534 pages, using the old-fashioned means of looking at book lists, the shorter the list the earlier the book. This worked for Dave and Charles. The only exceptions to this we knew of were in the Picture Covers. If a book listing 44 titles on the back has an ISBN number on the copyright page it is a much later printing, ISBN numbers weren’t used until book #49’s second printing in mid 1970. This would be an old cover bound on to a 1970 book. For the second edition of “H&HI”, released April 1997 with over 564 pages and officially called the “Revised and Enlarged Edition”, technology was becoming a better tool. Tony had developed a computer program that allowed the computer to “read” the books. Not just scanning pages, but looking at the letters for plate wear and reading the words for spelling corrections. We were amazed at how accurate the first edition was without using this technology, but it did help us solve problems with some books we were unsure of. Even more improvements included in the second edition were EXACT copyright and release dates for each book, giving more insight to the 1950’s books. No, two books were not released in 1953, just two copyrights filed that year. And there was a book released in 1958, it was just copyrighted at the end of 1957. Another addition was 22 pages of photos showing various collectibles and unused cover art. And a new “Post 1979” Grosset & Dunlap printing guide. I was always at odds with Tony about stopping the picture cover coverage at 1979, since they are still in print today! The computer scans were completed in time for the publication of the third edition in June 1998 with over 618 pages. We now knew for sure the first printings of #1, 2, 3, 16, and 32, and had data to back it up. We added 15 pages of trivia like the boys’ ages mentioned in each book, they did get older! Who is more popular? How many times each boy’s name is mentioned in each book. Which books are longer & shorter? Exact word counts for each text. We also delved into the Box Gift Sets and non-Grosset & Dunlap Library Bindings. Sadly, three years would go by before our next update. Some collectors thought we had lost interest like Dave Farah had (Dave would wait over 6 years between his10th & 11th editions). We were just busy with many things in life, including research for the 4th edition. We visited The Kingsport Press in Kingsport Tennessee; they printed most of the Hardy Boys and other Stratemeyer Series Books from 1945 to 1980. Even better news was that they still had most of the index cards showing the printing history of the books! This helped us pinpoint the exact dates the Dollar Box Picture Covers were printed (it was in 1961, not 1962 as most people thought), which changes the history of the Picture Cover, moving it back a half a year. We also discovered the mystery to the single page end-papers of 1963 & 1964. There are no records of Kingsport Press printing these books in these years, a book plate in one of these copies says the book was printed at Cadillac Printers. Another important event was the opening of the Stratemeyer Collection at the New York Library. This allowed us to include the working/suggested titles for each book, as well as informed us as to which title was originally to be another book. 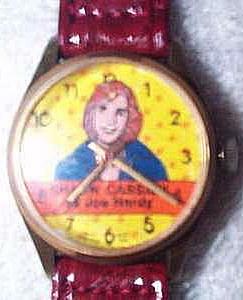 In one case it told us what was to be a Nancy Drew title (and vice-versa). All of this new info was incorporated into the fourth edition, June 2001 with over 690 pages. This edition came out with a “Stop The Presses” fanfare. Just as we were going to print, a new first printing for “Hooded Hawk” was discovered and new printing discs with the new info were rushed to the printers. Other improvements to this edition were an expanded paperback section with more detail about individual printings. I also felt that our guide was not as easy to read as the old Bayport Companion; so a re-structuring of the text with more headings to announce major changes in the books was done. I think we came up with a more informed, easier to read edition. What’s in store for the 75th anniversary in 2002? Unfortunately, like all of the other publishers related to The Hardy Boys, we won’t have anything ready for May, but an anniversary edition will come out this year. The Great Clues Brothers Quiz! I just stumbled upon your site while doing some research. By way of introduction, I write the Bayport Revisited articles (about 6) published in Yellowback Library, a series book collectors magazine. Currently, I am preparing an article on the orange Hardy Boy end paper print (Gretta) for publication in the May issue. I hope to read the back issues of your publication in weeks to come. Unfortunately, I read #35 first, specificaly the Cabin Island Dixonian Ethical Reformation essay. How anyone can read the original Cabin Island and develope such a narrow and limited diatribe strangles my imagination. Brian Porick appearently doesn't realize that there isn't a Frank W. Dixon. He apparently also doesn't understand why the books were re-written, not that I feel they should have been. The original brilliant Stratemeyer plot involving ice boats (try to find another book on that subject), a coded message, and a remote ice bound island go unmentioned. One of my favorite chapters involves a bottle jammed in the log wall which makes a ghost like moan when the wind hits it. The sense of adventure and comradory as the boys pack up and prepare to winter camp affected my life in that I evolved into a high altitude mountaineer and rock climber twenty years after I read this book. To discuss such an adventure story in terms of guns or ethical reformation is meaningless to the 10 year olds who read it. 35 years after I first read Cabin Island I still remembered the winter camping, the ice boats and the coded message. The guns and other matters Brian Porick chose to focus upon were new ground for me when I reread the book (original text) with my son.